When communities attempt to engage with decision-makers on the importance of complete streets, it is crucial to frame the argument within the context of larger policy issues. Sustainability. Healthy communities. Transit. In recent years, these terms (and many like them) have become embedded in the vocabulary of all things urban as planners, politicians, and citizens alike negotiate the rocky road of attempting to move forward for positive change. In processes that can take years and decades to develop, urbanization has seen forward progress, political and policy standstills, and all too often, complete and utter reversals in positive steps already taken. Facing this reality, planners and policy-makers from across Canada and around the globe came together in Hamilton in early November to discuss the issue of sustainable mobility in an urban setting at ACT Canada's Sustainable Mobility Summit 2012. Over the course of four days, the conference aimed to share ideas on building healthy communities, as representatives from multiple Canadian communities came together to build synergies going forward. The City of Hamilton's Peter Topalovic summarized the goal of the summit: "Transportation is not just about transportation - transportation is about city building and livable cities." Topalovic didn't make this statement during any of the Summit's many seminars, but during a wrap-up community session held on the final evening of the conference. Providing a summary of the Summit to the twenty-five or so people in attendance, Topalovic set the stage for an evening of engagement and discussion that would prove to be quite revealing about Hamilton's own decades-long urban planning experience. A two-hour affair, hosted at the doorstep of one of the Steel City's infamous urban highways, King Street West, the dialogue began with a telling presentation on cycling infrastructure by Nithya Vijayakumar and Steven Bishop, of UK-based transportation consultancy Steer Davies Gleave. Vijayakumar began the presentation by providing examples of urban centres that have taken the concepts of sustainable mobility and livable cities to heart. Bishop followed with a more in-depth discussion on the work that their firm does to guide planners and policy-makers towards such results. One of the most important things taken from the entire evening was that when communities attempt to engage with decision-makers on the importance of cycling, it is crucial to frame the argument within the context of larger policy issues. For example, the proven economic benefits of cycling infrastructure could be presented alongside multiple health benefits. Given the current focus on a looming public health crisis with regards to our sedentary lifestyles and increasing levels of chronic disease, this argument could go a long way in helping to build public support for improved cycling and transit infrastructure. Building on his health example, Bishop focused the remainder of his talk on the importance of community engagement (an appropriate topic for a community meeting), providing a number of positive ideas that could be used by Hamiltonians and citizens of other municipalities who are facing similar challenges. Going beyond the simple "call to arms" that one often hears at community meetings, Bishop provided two solid examples of potential tools that could be used for community consultations in the very near future. The first tool, Cycle Auditing, is a unique approach to community consultation, as a GPS video camera - known as Roadhawk - is attached to a bicycle to document the cycling experience on a chosen route. More amazing is that beyond simple video, the tool also captures speed, bumpiness, and altitude, providing a complete set of data that allows planners to note pinch-points, trouble spots, and the overall safety of various routes. Not only do these videos help planners to understand cycling infrastructure issues, but they also serve to help connect planners to the public, as people can see firsthand the experience of cyclists in their city. Available at a low cost, this technology could quite easily be used in any city hoping to better understand their current cycling situation. Another unique and relatively easy-to-manage tool that Bishop presented was an interactive online map, where people can use pins to note trouble spots and provide comments, which can then be used by planners as data. After showing an example of the success that such an initiative had in England, Bishop went above and beyond, showing the audience a new map that his team had mocked up in an afternoon, that of Hamilton. I was quite impressed with this effort, as it showed the true passion that Bishop and his colleagues have for aiding in positive change. Yet again, another tool that with the right communications effort, could be used to engage with citizens of any city to better understand existing gaps while helping to guide decisions that encourage efficient use of available resources. Bringing his presentation full circle, Bishop reminded the audience that these tools can be powerful in facilitating community engagement in the planning process, while reinforcing the fact that such engagement can provide the foundation for positive change. The key point that came across throughout was the need not only to engage, but to engage with purpose. That is, to engage in a way that encourages others to see the mutual benefits that improved cycling infrastructure can bring to a community as a whole. Such an approach would include education and training, better signage and mapping of bike routes, and an integrated communications campaign-using both social media and more traditional advertising-to engage with the public. In doing so, such a strategy could help individuals and communities to appreciate the economic, social, and health benefits of cycling, thus building support for healthy community and city building. During the question period of this first talk, the point was raised that despite having the right tools, a solid evidence base, and an existing infrastructure that people realize needs to change, community groups still feel handcuffed by the lack of action taken by their political representatives. As one resident put it, in referring to Hamilton's own situation, "What do you do about a city council that will just say no?" In response, Bishop reiterated his point that the issue needs to be framed in a way that will allow politicians to get behind it (i.e. you need to build wide community support that demands change), but had little more to offer in terms of local solutions, admitting that this experience is a common one in many municipalities around the world. This question was addressed in more depth, however, by the session's next presentation, delivered by Ryan McGreal. A Hamiltonian with a great deal of community engagement experience, McGreal is the editor of Hamilton's own "Raise the Hammer", well known locally as an online source of articles and blogs that promote revitalizing Hamilton. McGreal's perspective as a Hamiltonian gave the much-desired local flair to the evening that those present were after, and complemented the earlier "outsider" perspective of transportation consultants Steve Bishop and Nithya Vijayakumar. 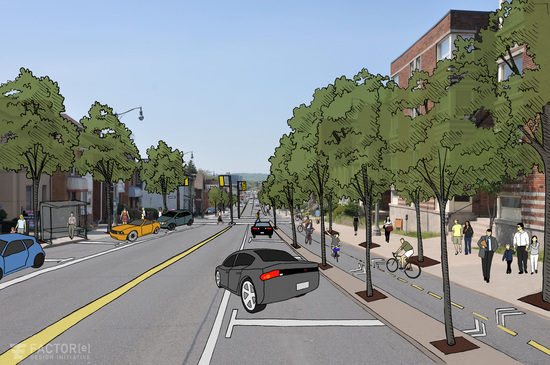 Also, while the earlier presentation focused largely on cycling infrastructure, McGreal focused more broadly on the idea of complete streets and the role of community action in gaining public support to push for such changes in Hamilton. In a community where two of our major downtown streets serve as urban highways, a reality that underlines the value we've placed on the automobile over all else, an engaged citizenry could be the catalyst needed to push for healthier community infrastructure and forward-thinking transportation policies. Now before anyone who only drives through the downtown states that Main Street has sidewalks, provides space, and that people can bike on it if they want to, I'd like to make an admission. I currently live in an apartment that overlooks Main Street West, between Locke and Queen Streets in Hamilton, so can attest to the reality that five lanes of one-way traffic brings to an area. As I write this, the noise of vehicles roaring by is a constant reminder that our current state of affairs in no way provides a balance between different modes of transportation. Moreover, as someone who frequently cycles east into downtown via the bike lane on the Main Street West bridge over the 403, I can also attest to the fact that abruptly ending a cycling lane and expecting cyclists to merge into five lanes of heavy traffic is in no way "balanced." I would love to use the Roadhawk technology mentioned by Bishop in his talk (see Part 1 of this post) to give Hamilton drivers (and other cyclists) an idea of what five lanes of traffic feels like during rush hour. But I digress. The safety statistics relating to car speed and one-way vs. two-way streets resonated with both myself and the wider audience, as his local examples proved to give a context that many in the room could appreciate from firsthand experience. From safety, McGreal then touched on the overall health benefits associated with complete streets beyond simple safety measures, reaffirming the notion that livable communities are healthy communities (both physically and mentally). On economics, he provided examples of increasing property values and levels of retail spending in local businesses where complete streets have been implemented, and also noted that two-way streets can encourage transit-oriented development (LRT anyone?). In all, one was left with a convincing argument as to the benefits of promoting a shift to more two-way and complete streets in Hamilton. Not spending too much time preaching to the choir, however, McGreal then built on the focus of Bishop's earlier talk-how to engage with our communities for change that will make Hamilton a more livable city. Speaking as a veteran of community engagement in municipal politics, McGreal noted that while we have local policy directives, evidence, and expert advice all promoting a shift towards two-way complete streets, we are lacking one key ingredient, leadership. While Hamilton has many community leaders on board, what is still lacking is a true political champion to speak on behalf of a public that demands change. On this point, McGreal also emphasized that in order to get the political leadership needed to promote sustainable mobility changes in Hamilton, we need citizen leadership to begin a broader public dialogue on the issue. Stating, "we need to build a strong, compelling, evidence-based narrative", McGreal put out a passionate call for the development of a citizen-based group (already in the works) that has the mandate of engaging the wider Hamilton public and gaining a critical mass of support that will influence our politicians to react to demands for a more livable city. Combining the ideas proposed by the transportation consultancy presentation, in which some great strategies for successful engagement were shared, with the local passion that McGreal brought to the table, there seems to be a unique political opportunity in the making for the future health and prosperity of Hamilton. Though this session was only one small piece of a larger and more complex municipal puzzle, I left with a feeling of hope that if framed in the correct way, and using the various networks and skill sets of passionate individuals such as McGreal, a true movement for change is stirring. The success of this movement hinges on supporting a balanced approach to change, creating a respectful space for dialogue and engagement, and communicating the public health benefits-alongside environmental, social, and economic benefits-that such change could bring. I'll end with one of the most poignant points made throughout the night, stated by Ryan McGreal, which is: "If we want leadership, we need to find it in ourselves." Now it is up to Hamiltonians to "saddle-up", so to speak. Oh, and if you're wondering, our next municipal election is just under two years away. They'll be listening. This article was first published in two parts on David Heidebrecht's website: Part 1, Part 2.
he said push this button with your left hand.